July 23, 2018 – (Ottawa, Ontario) – Canada’s Building Trades Unions (CBTU) is looking forward to working with the new Ministers, following Justin Trudeau’s latest Cabinet shuffle. “We have made positive strides on many important files on behalf of our 500,000 members from across the country and we are confident that we will continue the momentum with the recent Ministerial changes,” concludes Blakely. A celebration of life will be held this weekend in memory of our friend and brother, Don Paton. On Sunday July 29th. from 1:00 to 5:00 pm please join with us in remembering this very special man. The event will be held at the Operating Engineers Union Hall located at 4333 Ledger Avenue in Burnaby. We look forward to seeing you there as we look back on a life well lived. 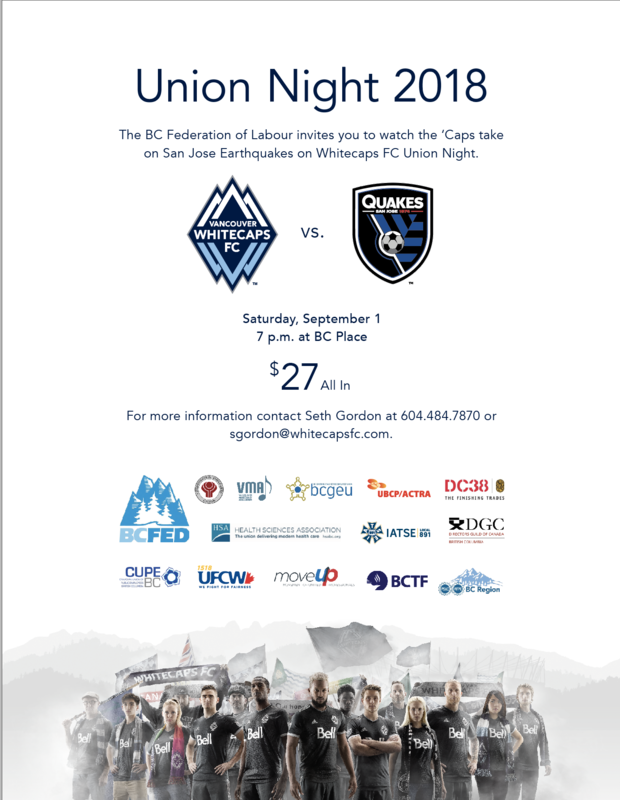 District Council 38, along with other Unions affiliated with the BC Federation of Labour, has taken advantage of a special offer by the Vancouver Whitecaps to allow Union members to attend their September 01 match versus the San Jose Earthquakes for a reduced price. Tickets that were normally priced at $36.00 are available to our members for $27.00. Please see the attached poster with regard to this offer. DC 38 intends to purchase a limited number of thickets for this match. If you or your family are interested in this special promotion, please contact Paddy Byrne at 604-580-3112 and be sure to mention that your are interested in purchasing tickets for this match. At this year’s annual retirees recognition celebration two things were missing. First, Paddy Byrne, the Director of Training of the FTI, who normally serves as the Master of Ceremonies at the pin presentations, was away in Greece celebrating his wife’s 60th birthday. 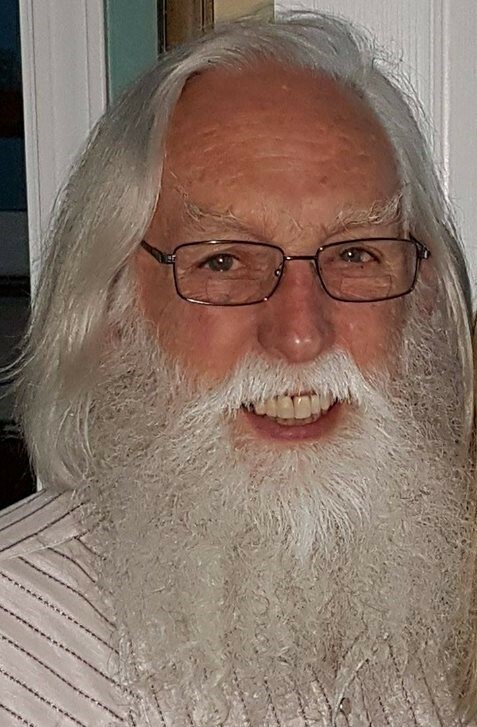 Second and more importantly, William (Bill) Hunt, our longest serving, continuous member of our Council, was unable to attend due to health issues. Today both Bill and Paddy were able to get together along with Business Manager, David Holmes, to recognize an important milestone in our union’s history. Bill, at the fine old age of 98, was presented with his pin recognizing his over 70 years of continuous membership in our union. This is an amazing accomplishment and marks the first time ever our Council has handed out a 70 year pin. 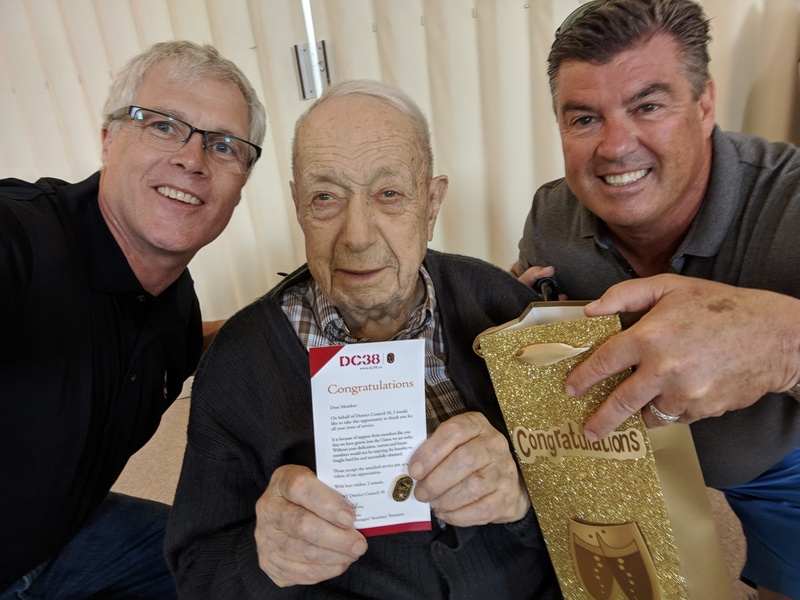 Bill was very appreciative of the fact that Dave and Paddy took the time to travel out to Abbottsford in order to present Bill with his pin personally. However, Bill’s biggest smile of the day came when Paddy presented him with a nice bottle of Cabernet Sauvignon. Paddy told Bill that he and Dave are looking forward to presenting Bill with his 71 year pin next year along with another bottle of wine, which of course elicited another big smile from Bill. Congratulations again Bill from all of the Members of IUPAT DC 38. (UPDATE) Sadly, it is with our deepest regrets that we must inform you that our beloved friend and brother, Don Paton, has now passed away. We were informed this week by his daughter Laura, that Don succumbed to his illness on Monday evening. A memorial service is being planned for Don, sometime around the end of July. We will keep you posted as to the details once we receive them. Our sincerest condolences go out to Don’s entire family. We regret to inform you that long time Member of DC 38 and former Business Representative for Glazier’s Local 1527, Don Paton, is in failing health. 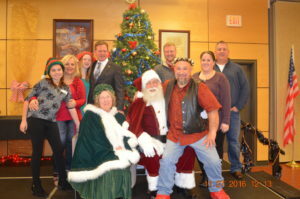 Don, known to most of our members as “Santa Claus” at the annual DC 38 Children’s Christmas Party, is currently battling cancer and by all accounts, our beloved brother has very little time left with us. Director of Training Paddy Byrne and Drywall Finishing Instructor, Kelvin Campbell, paid Don a visit at Abbottsford hospital yesterday in an effort to pick up Don’s spirits and to let him know his brothers and sisters at DC 38 have him at the forefront of our minds right now. 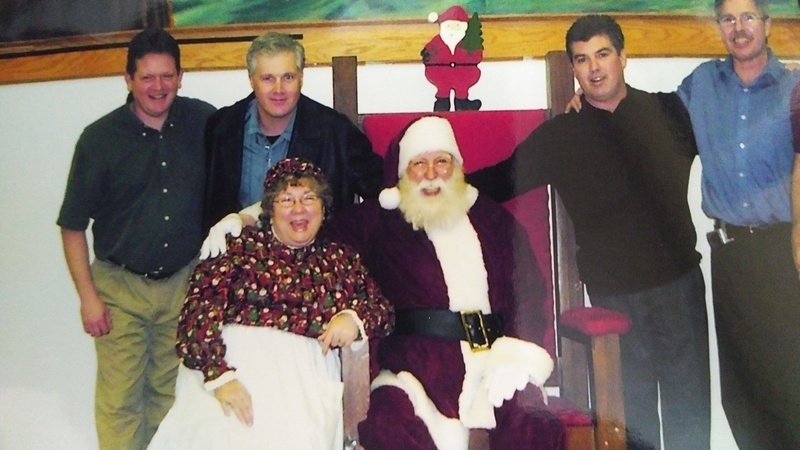 The sad story here is that Don only recently lost his wife Patricia, who was our “Mrs. Claus” to this same terrible disease. Don was so consumed with looking after the love of his life in her final days that he never let anyone know the pain that he was suffering from and the extent to which the cancer in him was progressing. Don is currently in room 3036 at Abbottsford Hospital, however there are plans to move Don into hospice as soon as possible. Don would welcome anyone who would like to pay him a visit but please check with the union hall first as to the status of Don’s situation. We wish Don and his family all the best in this time of sorrow and wish to express our love and gratitude for everything Don has done in the service of our union. Speaking with Don yesterday, he told us that his fondest memories will always be of the union Christmas parties and the joy both he and his wife Patricia shared in spending time with all of the children and their parents. Don’s only regret was that Christmas wasn’t 365 days of the year. Recently, 42 representatives from across the North American glazing industry met in Hanover Maryland, to develop written and practical exams for the Architectural Glass and Metal Technician Certification (AGMT). Mark Longmore, Head glazing Instructor and Coordinator for the FTI was invited along with Paddy Byrne, Director of Training for the FTI, who is also a glazier by trade, to lend their expertise and be part of this historic undertaking. Driven by numerous recent glazing failures on some extremely large commercial projects throughout Canada and the United States, industry got together to figure out how to best to address this multi million dollar problem. In the end it was decided by all those connected to the industry such as glazing contractors, caulking suppliers, aluminium extrusion manufacturers, fabrication companies, architects, engineers, spec writers, insulated glass suppliers and especially the insurance underwriting community, that the glazing industry needed a major overhaul. The overhaul started with a new certification process for glazing contractors which has already been developed by, Administrative Management Systems Inc. (AMS), a recognized leader in product compliance testing and certification in the glass industry, headquartered in New York state. This program is currently being implemented in several major cities in the United States and Canada. However, once that part of the concern was addressed, it was decided that there needed to be a program developed across North America to address the skills of the workers who install these highly complex glazing facades. Administrative Management Services Inc. has also been selected to develop the AGMT certification. In Canada we have the Red Seal which is recognized across our country as the standard in the industry for trade worker certification. However, the Red Seal is a written exam with no hands on component to the test. This is where the AGMT certification hopes to establish itself as the gold standard in the industry. In addition to a 125 question written exam, there will be a practical component involving curtainwall, storefront and door installation along with a caulking and tooling mock-up. Not only will AGMT certified glaziers be tested on knowledge of their trade but they will also have to demonstrate their competency with the hands on skills connected to the trade. Beta testing is expected to begin sometime in the fall and there has been a target set of 100 glaziers to go through the testing protocol before the end of the year as part of the ANSI accreditation process. Please check out the video below which gives a good overview of what this program will look like and why the industry is so excited about it.